Drive customer traffic and generate hassle-free revenue. Service is part of our DNA. Our technology drives new revenue right to your door. Make a profit AND a difference. Our machines provide additional revenue to your bottom line, at ZERO COST to you. Join the 70,000 convenience stores, gas stations and car washes that enjoy generous revenue sharing from our hassle-free, highly reliable tire inflation programs. 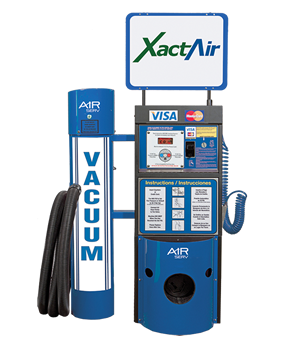 Our premium line of XactAir machines offers the industry’s most advanced technology available today. Every machine measures and auto-calibrates tire air pressure for ease and accuracy. Our 24/7 wireless diagnostics continuously monitor XactAir machines for technical problems and cash availability, relaying the data for analysis and quick dispatch when needed. 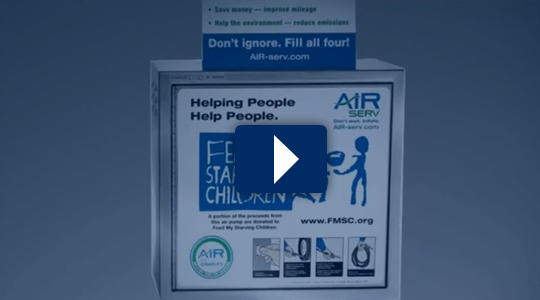 Our AIR for Charity program builds loyalty. When your customers use AIR-serv machines, they are also making a difference, which is a unique incentive for customers to make your location their go-to destination. Your customers can feel good about helping others – and appreciate you for giving them the opportunity. This is also all at no cost or extra effort for you or your customers. A trained and experienced AIR-serv representative will conduct our Free Site Evaluation and then customize the three core success elements for each location. Just what is proper inflation, anyway? It’s simply making sure your vehicle’s tires are at the pressure specified by the vehicle’s manufacturer. The right tire pressure varies by vehicle and by model, and is usually specified on a sticker inside the driver’s door jam, in the glove compartment, or in the vehicle owner’s manual. Do not use the tire pressure listed on the tire itself—that’s the maximum pressure to which a tire can be inflated, not the pressure for optimum driving and efficiency.